Located in the city of Port Angeles on Washington State's Olympic Peninsula, C Tech Defense Corporation is a small, highly capable company on the leading edge of new technologies in the fields of aero-ballistics, hydrodynamics, and directed energy devices. We provide research, design, and limited on-site testing services to our customers quickly and efficiently. The staff at C Tech has extensive experience in design, fabrication, testing, modeling and simulation of projectiles and explosives. Additionally, our core competencies are augmented by a nationwide network of consultants who are recognized experts in their fields. C Tech applies a multi-disciplinary approach to yield innovative solutions to a wide range of problems. Some of C Tech's work appeared in the May 2001 issue of Scientific American with a sidebar discussion of underwater speed limits here. If you are interested, the complete text on cavity creation and its effect on underwater speed limits can be found here. 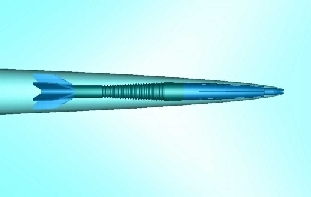 For more information on our supercavitating projectiles please go to our projects page. We are constantly updating this site with more information and will soon be adding a page on the science of supercavitation. Bookmark this page and check back often. You may also contact us directly with questions. Thanks! Web Development: Wind's Eye Design, Inc.